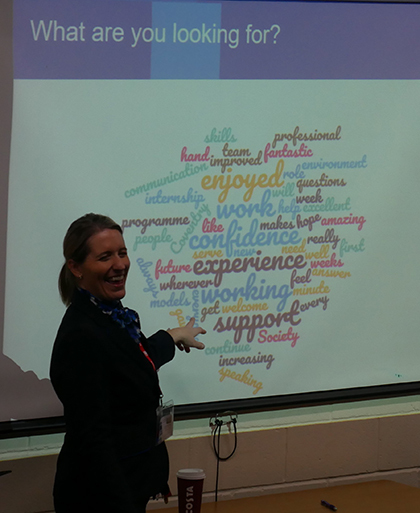 Business students at The Sixth Form College, Solihull heard about an exciting progression opportunity this week, when a representative from Coventry Building Society came into College. Sue Burrows from the Shirley branch of the Coventry Building Society visited to tell students about their exciting 6-week summer internship. Taking place during the summer break, this paid placement enables students to get hands-on experience of working within a local branch. If successful, the students will be dealing with customers in branch and on the phone and will develop valuable employability skills. For those that want to work in the mortgage section, an internship in Coventry is also available. The students were told all about these roles and what working for the Coventry Building Society is like. The skills they need to demonstrate were explained to them, as was how they can apply and what they will be looking for in their CV application. The application process is highly competitive and students will need to go through an interview for the chance of getting one of the 12 positions available. The College have staff who work to support students’ progression ambitions. Whether it is careers advice, work experience placements or support in applying for internships, sponsored degree programmes or apprenticeships, there are alternatives to university for our students to apply for. All students on the BTEC courses do a work placement as part of their studies, with an emphasis on developing career readiness in all those students.